We are in the thick of launch season but one team has been getting much more attention than the others. 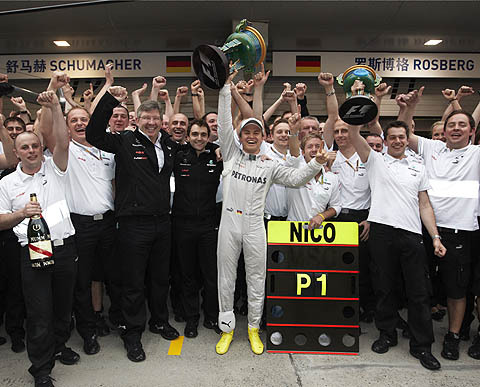 That team is of course Mercedes, which last month announced the appointment of Toto Wolff as its new motorsports head. This promptly raised questions about whether team principal Ross Brawn would stay and, as Pitpass' business editor Christian Sylt revealed, even Bernie Ecclestone seems to think his days are numbered. It wouldn't be a surprise if Brawn left because he has steered the team to just one victory since Mercedes bought it in 2009. That's not all. A report by Sylt in today's Mail on Sunday reveals that the costs of last year's title campaign accelerated to £242.1m - the highest amount spent under Mercedes' ownership. Mercedes operated within the self-policed Resource Restriction Agreement (RRA) but it isn't so sure about its rivals. The bulk of development work on F1 cars is done during the year before they are launched so Mercedes' performance last year was fuelled by its spending in 2011. Accounts for the year to 31 December 2011 show that although the costs of Mercedes' team decreased 0.2% to £125.7m, it spent £116.4m on its engine division - a 54.2% boost. Its spending was driven by investment in Mercedes' SLS electric supercar, the KERS energy-recovery system and the new V6 engines which are due to be introduced to F1 next year. Research and development costs on the engines alone increased £17.3m to £52.4m. Across both divisions a total of 78 new staff were hired taking the total head-count to 989 and giving Mercedes an overall wage bill of £60.1m. Whilst the engine arm made a £4.9m net profit, the team lost £10.6m after tax. The RRA is the key mechanism in place to curb costs in F1 and since it only applies to certain areas of spending Mercedes was able to comply despite its accelerating spending. However, the accounts reveal the team's frustration that its rivals may not be adhering to the terms. "The RRA, which had been fully implemented in the previous year, has been the source of tension between the F1 teams. There is a growing sense that the verification and compliance regime may not be sufficiently robust to give teams the necessary confidence that all competitors were applying the restrictions consistently. The RRA and the certainty of a level playing field is one of the biggest challenges facing F1 teams for the future," says company secretary Caroline McGrory. Since Mercedes bought the team its racing and engine divisions have recorded total costs of £670.9m. Revenue comes from four main sources: sponsorship, prize money, two other teams which buy its engines (McLaren and Force India) and cash payments from Mercedes' parent Daimler.